This is utterly and truly a first world problem. But it happens, I just can’t help myself. I hate-hate-hate when someone order’s something more delicious than me at a restaurant — order envy strikes when I least expect it. Last Saturday, I met up with Kelly, my friend from journalism school, for a catch-up brunch. I chose Origin Restaurants & Bar because Adam and I had a fabulous anniversary dinner there over the summer, and I was eager to see how MasterChef Canada judge Claudio Aprile cooks his eggs. Origin is also one of the few spots in Toronto taking brunch reservations, so in an effort to avoid the morning brunch line-ups, I booked a spot at this classy eatery across the street from St. James Cathedral on King East. The decor is sleek and kitschy at the same time: Modern furniture with exposed brick, black walls with pink accents are paired with eclectic light fixtures, and a large Victorian family portrait features a Stormtrooper’s mask imposed on a youngster’s face. After much deliberation, Kelly ordered the fried rice with crispy eggs and pork belly ($19) and I went with my typical choice, the eggs benedict. I just love the classic brunch dish, and it’s always good. Service is done well at Origin, our waters were refilled constantly, and my cappuccino ($6) was perfect. All around me, beautiful plates piled high with food were coming out of the open kitchen, the salivating began. I could not wait to see the eggs benny. My plate arrived first, two poached eggs placed upon a thinly-layered pile of honey glazed ham, with a spit of hollandaise and not much else. No potatoes, no side salad in sight. When the server arrived a few seconds later with Kelly’s sizzling platter, my heart began to sink. As she cut into her oozing tempura eggs, I felt my skin slowly turning envy-green. To add insult to injury, the hollandaise was a little cold. My optimism vanished in a puff of steaming fried rice. Order envy in full force. 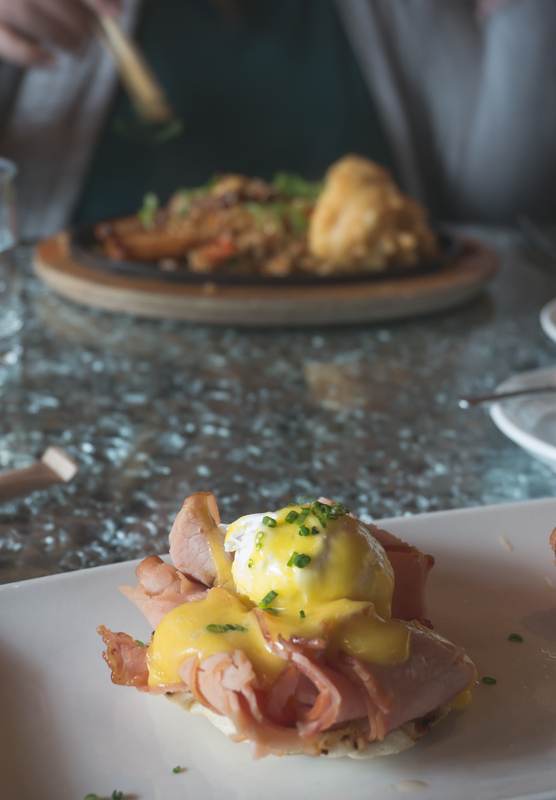 Don’t get me wrong, the eggs benny were good, the ham was plentiful and delicious, and though the hollandaise was scant, it was tasty and lemony. The biggest issue: no side! I had assumed it came with fries or salad or something, especially for the $18 price tag — but alas, my brunch dreams dashed. Meanwhile, Kelly’s overflowing plate was impeccably appetizing. There was so much deliciously fried rice that she was kind enough to let me taste her breakfast. The pork belly was melt-in-your-mouth flavourful and rich, and the eggs — oh my god, those tempura eggs — they were so good! I mean, really how can anything fried in tempura be bad, but the eggs were flawless, light and crispy on the outside, and the perfect oozy poach on the inside. Overall the meal was good, the company even more so, but the green-with-envy pallor of my skin is only now beginning to fade. I might never order Eggs Benedict again.